The question caught me off guard. I was at the counter at the bank and reached to grab my receipt. The teller was looking at my wrist. You’d think this would be a common question. I’ve been wearing a medical alert for years now, but this was first time in quite some time that someone had noticed and asked about it. I told her that I got it awhile ago online, and thanked her. I left wondering if perhaps she was diabetic too. These days I wear my medical alert every day. Despite having a pump, which to me would be a sure sign that I’m diabetic, I know that it’s still important to wear an alert in case of an emergency situation. But while it’s important to alert an EMT, I don’t always want to alert every single person I come in contact with. A medical alert bracelet is an identifier. It says something about you: you have a serious medical condition. While my alert does say diabetic, you may not see that at first glance. Instead, a person who sees it just knows that I have some kind of medical condition serious enough to need to wear an alert. There’s nothing wrong with wearing some kind of identifier. I do it all the time. Sometimes I wear a Jewish star, other times I wear a Michigan sweatshirt, or a Detroit Tigers t-shirt. These all tell you something about me: my religion, where I went to school, where I’m from. But those are identifiers that I choose to wear, that I want to show others. I don’t necessarily view my medical alert bracelet the same way, to me wearing it isn’t a choice, it’s a necessity. I’ve gone through a few different medical alerts over the years, and went a few years without one. It’s been kind of like Goldilocks, trying different styles and options until one was just right. I was allergic to my first medical alert bracelet. Ironic, right? My parents got it for me after I was diagnosed. My mom picked out a delicate sterling silver bracelet with the medical alert plate that was engraved with type 1 diabetes on one side and my name on the other. But after starting to wear it, I began to develop a rash on my wrist where it was. Whether the bracelet actually gave me a rash or I just started scratching where it was, creating the rash, I’m not sure. But from that point on, I refused to wear it. After that one, I switched to a blue neoprene bracelet and wore that one until it started to fray. There were a few different bracelets after that, but those didn’t last too long either. And there was a brief time when I didn’t want to wear one at all. That piece of metal has been on a few different watches over the years, but it’s always on me. I forget that it’s even there. 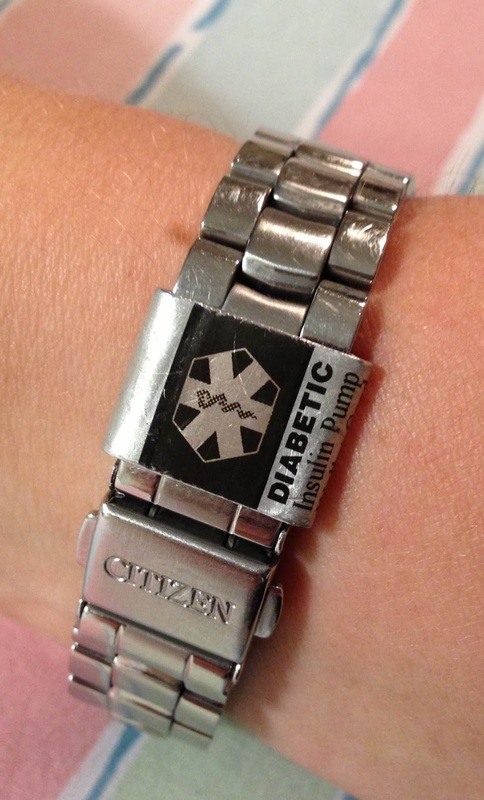 But while I might forget that I’m wearing a medical alert, it’s pretty hard to forget that I have diabetes. Here’s the website where I got mine, they are called The MediBand and have a few different options you can choose from. It comes with a silver and gold band. I've never seen a little band that goes over your watch like that! Very cool, and thanks for sharing the link. I went many, many years without wearing a medic alert identifier of any sort, and am just now finally getting into the habit. My bracelet has the ICE phone # of my husband. I hope no one ever has to call him! Thanks, and no problem! I'm glad you're back in the habit, it's a good one to have. I also hope that no one ever has to call your husband for an emergency either! This product is really cool and has a series of various Diabetes inscriptions and other medical conditions too. I wear mine every day. The correct link is http://www.id-technology.com. Yea I just fixed it so it should work now. Thanks again, they really are great.